Home / Child Communication / Kinetic Sand Rocks for Speech and Language! Kinetic Sand Rocks for Speech and Language! 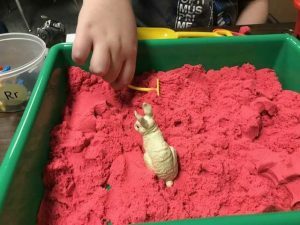 So when Mark was little, he loved kinetic sand–it was so good for his sensory skills! 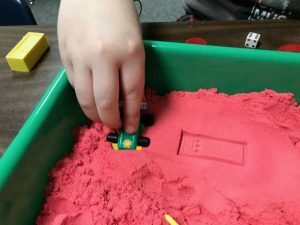 Today as a practicing speech-language pathologist, I find that kinetic sand is very highly motivating for the kids on my caseload. “Is Miss Cewest here today?” the kids ask Debbie Johnson-Garcia, my friend and full time SLP, every Friday. We laughed yesterday as I was disabused of the notion that it is my charm and fun personality that the kids want. DJ confessed: it’s the kinetic sand! I can hardly pry it out of their hands when therapy is over! Many children today NEED sensory experiences–they can’t get enough of them. My personal, professional opinion is that they already get so much screen time that they just crave sensory experiences. They love the kinetic sand, and even 5th graders will request it. 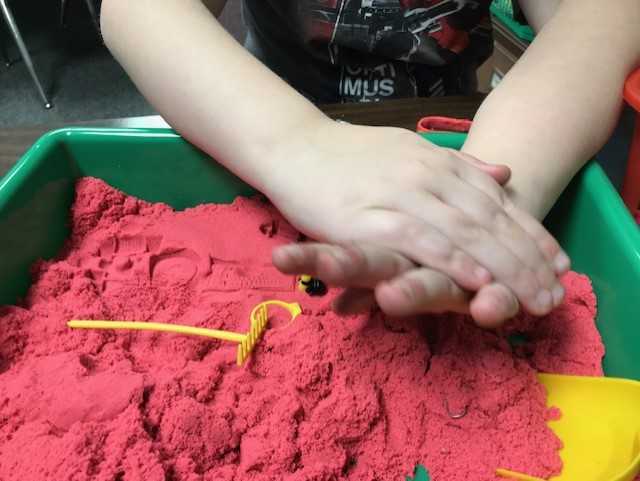 I use the sand for language and articulation therapy. Here, “Danny” (w/r substitution) is using 3D /r/ objects to play and make impressions in the sand. In 20 minutes, I got 106 good /r/ productions out of him–words with /r/ in pre-, inter-, and postvocalic positions. We also worked on vocabulary. You can work on prepositions, present progressive -ing….anything. I recommend Lakeshore Learning’s kinetic sand. There are cheaper brands out there, but theirs lasts the longest and feels the best. Want to add fun and motivation to your treatment sessions? Kinetic sand to the rescue!